Submission By: Dan McGrath Intro – Why automate your lights? Well, to be honest, most of my house is automated, so it seemed the obvious thing to do. There are lots of benefits in automating parts of your house, lighting in particular just makes life easier, lights coming on when you walk into a room is better than switching them on yourself! ….and because they turn themselves on, they turn themselves off too, so you can’t forget! Design – I’ve never been sure about X10, to be fair I’ve never tried it either, but my thinking is that DMX has been in used for hugely elaborate lighting systems for years, and is known to be very robust and reliable, and that’s what I wanted, so I chose DMX. The dimmers I have chosen support both 0-10v signal and DMX, and you can use both at once if you like, this is great for me as I’ve set them such that priority is always given to the 0-10v signal, so you have the option of manually overriding the settings that the home automation system sets. Installation – Ok, lets start at the light switches themselves. Each room has either a double (two lights) or a single dimmer control mounted on the wall. The pictures below show the dimmer control units mounted in the wall, you’ll see they are still unfinished, I’m unable to find suitable looking knobs, like the simple white ones you get on a standard dimmer, so until I do, there are none. This is a temperature sensor that I use to control the heating, it uses the same enclosure as the dimmer units and the same run of cabling, but they are two separate systems. The double units are a bit more busy inside, but essentially just two singles in the same box. These dimmer control units are connected using Cat5e cabling back to my understairs cupboard, where the rest of the kit is. The control units can be easily disconnected from the wall by unplugging their RJ45 plug from the connector. Each dimmer location in the house has a single run of Cat5e to it all home ran back to under the stairs. The units themselves simply act as a potentiometer, the variable resistors have 3 legs, looking from the front, the leftmost one is grounded, the middle one (the wiper) is the output, and the right one gets 10 Volts DC. Notice the use of heatshrink sleeving and a dab of epoxy to hold everything in place, this makes for a more reliable unit I’ve found Connecting them up in this way means that as you turn them clockwise from off to on, the voltage on the middle leg rises gradually from 0v to 10v – This is used to control the dimmer units manually. Above are some pictures of how the dimmer control cabling terminates under the stairs, I’ve used standard Cat5e cabling throughout as it is cheap and good quality, I’ve also used RJ45 plugs and connectors for the same reasons, this lighting system has nothing to do with ethernet, tcp-ip or the like, I’m just using the cabling and connectors normally associated with this sort of thing. In the picture above, each yellow patch cord represents a dimmer control location, I’ve used the RJ45 wall sockets as a means of connecting these cat5e runs up to both the dimmers and the temperature sensor control board. The dimmers themselves are 4 channel units that support both DMX and 0-10v signal to control their output. I didn’t explain this very well originally, so here is some more information on how the 0-10v signal and DMX work together. The setting of the 0-10v signal (i.e the setting of the dimmer control unit) will (if brighter) override the DMX setting. This isn’t ideal, as it does mean you can leave lights on by mistake, as turning the dimmer all the way up will force the light to stay on. However, we don’t actually use the dimmer controls manually, the lights come on automatically if it is both dark outside (there is a light sensor in the garden) and if someone is in the room (the PIR sensors tell the server if this is the case). So there is never any need to turn the lights on yourself! The other potential problem is if the system turned the light on, and you actually wanted to turn it off, turning the dimmer control down would have no effect either. In reality though, the dimmer racks have a configuration switches on them, should I ever experience a difficulty where the server did something I didn’t like, I could either flick one of the DIP switches on the rack, or unplug the DMX lead!! Here’s a link here to the dimmer rack instruction manual which probably explains it better! Additionally it means that you can operate your lights over the internet, via SMS, IVR etc.. which can be useful. 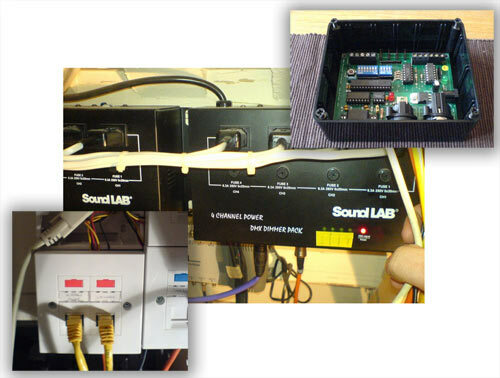 Above are some pictures of the DMX controller fitted in its box, it has three connections, power (12v dc), serial in and DMX out. There is also a link here to the dmx controller instruction manual. Finally a picure of the rear of the server that connects to the DMX interface, this server is used to control the DMX interface, more about that in the software section below. Software – All of my other home automation (security, heating, power, cctv etc..) is written (badly in parts) using perl. This lighting project is no different, although it does represent my first attempts at using web services. 3 Comments on "Homebrew DMX Automated Lighting System"
This is a great article. I am interested in the idea of using ‘stage’ style dimmer packs in a domestic situation. How do they last with 24/7 usage? Interesting – can you update again another year later? I’m looking at this in conjunction with a Loxone control system. There now seem to be a number of low cost DMX RGB LED dimmer/drivers at £25 or less on eBAy as well as the Soundlab type devices you’re using. I also found a 24 channel DMX switch for £200 so the cost per lighting channel looks very low and the kit is cheap to replace if it breaks. The risk presumably then becomes the communications protocol.